The Factory Theatre’s production of A Line In The Sand is captivating. Playing as part of the “Naked” Winter Seasonette, A Line In The Sand does away with everything except what is most important: the performances. 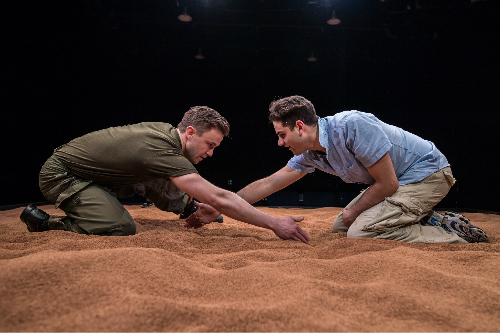 A Line In The Sand tells the story of the relationship between Mercer, a young Canadian soldier, and Sadiq, a teenage Palestinian boy, from the moment they meet on a beach to the eventual deterioration of their bond under the most horrific circumstances. Director Nigel Shawn Williams puts it perfectly when he writes that the play “investigates the cost of being human in an inhumane environment.” The relationship between Mercer and Sadiq starts off innocently but then turns dark as more of Mercer’s struggle is revealed. This leads to an intense second act where even more is revealed about the actual interactions of the two characters. The performances of Morgan David Jones (Mercer) and Danny Ghantous (Sadiq) are equally excellent both individually, but also in their interaction. Whereas Jones excels at bouncing between a confused young man to a troubled soldier, Ghantous transitions from innocent happy teenager to innocent, unwitting victim without missing a beat. John Cleland commands the stage in the second half with his performance as the Colonel. Cleland pulls no punches while interrogating Jones as Mercer, but also allows Jones his breadth to reveal the truth behind his character. As mentioned, the production is “naked” in that with little more than a large sandbox in the performance space, a complex, multi-leveled narrative is exposed. The audience, gave the show a standing ovation and clearly loved the experience as much as I did. The aspects of the show I especially loved were the abrupt lead-in to the intermission, which draws comparisons between the military activity in the Gulf in the early 1990’s to the more recent military activity in the area, as well as the scene transitions. The latter was little more than the lights being dimmed with flashes of sound and light. This gave a “what’s next” characteristic to the performance. That is not to say that what came before was not captivating but that it was so captivating that I was engrossed and wanted to see where the show was going. Credit for this is also due to playwrights Guillermo Verdecchia and Marcus Youssef and their excellent script. This production of A Line In The Sand is everything I love about theatre; a great story told in the very way it should be told. It is true that the production could have been more elaborate, but at its core, this play is about Mercer and Sadiq and everything else is just noise. Shows run Tuesday to Sunday at 8pm. Note the March 27th show is at 2pm.